CONTRIBUTED PHOTO: PATTERSON-GIMLIN VIDEO – The most famous image of Bigfoot comes from frame 352 of the well-known Patterson-Gimlin video showing a female Bigfoot, which has never been debunked. Guy Edwards first caught the Bigfoot bug as a second grader during a visit to the Vose Elementary School library while growing up in Beaverton. He found copies of books that explored famous myths like vampires, werewolves, and the Loch Ness monster. But it was the one on Bigfoot that caught his eye, especially the inside photo taken from the famous 1967 Patterson-Gimlin film that turned Bigfoot into a household name. Bigfoot became a secret passion of his as he thought others would judge him for latching onto a fringe belief. So, Edwards continued to read about Bigfoot, keeping it hidden. It was during one of his family’s trips into the woods that he finally decided to be open about his interest. They had met an older man who also believed in Bigfoot. The man had built a 9-foot-tall chair, and every night would leave a glass of apple juice alongside it, hidden away behind a shed door. Most experts agree “Bigfoots” seem to be drawn to apples, and the idea was that only something with thumbs would be able to open the door. “When I saw that my parents and the other adults were listening to what he was saying without laughing, I knew it was OK to be interested in Bigfoot,” Edwards said. OUTLOOK PHOTO: CHRISTOPHER KEIZUR – Guy Edwards believes the best way to find proof of Bigfoot is through data analysis. Bigfoot, also known as Sasquatch, is the name given to hairy ape-like creatures that reportedly live in the wilderness. People who claim to have seen one describe a large, bipedal ape-like creature, roughly 6-feet 9-inches tall. Sightings have been made across North America and internationally, though many have been discounted as hoaxes. The idea of Bigfoot has become a key piece of romantic folklore in the United States, spurring thousands to either prove or disprove the creatures’ existence. The popularity of sasquatches has spawned many television shows and websites dedicated to gathering evidence. Edwards’ interest as a young boy has grown into a love of Bigfoot research. 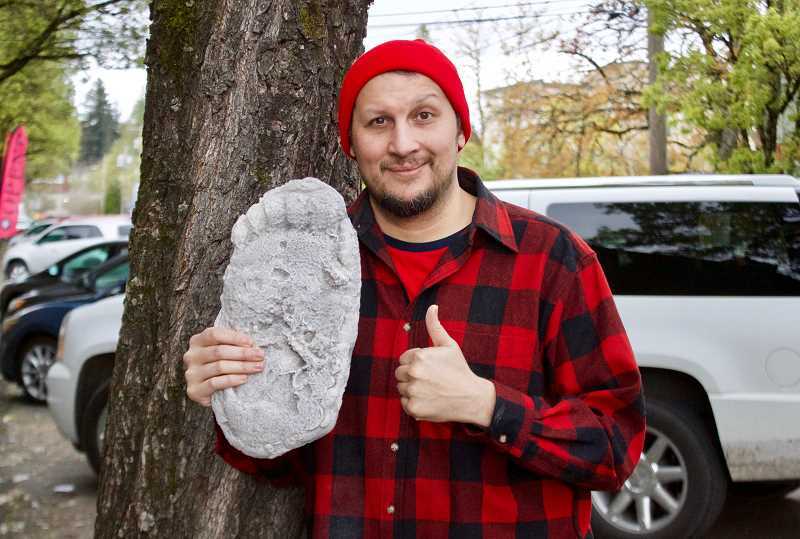 While his day job is helping businesses’ exposure on search engines, offering digital marketing services as the owner of Brainjar Media in downtown Gresham, he continues to search as an active member of the Bigfoot community. In 1840 an American pioneer settler wrote about what could have been Bigfoot long before a name was ever given to the creature. The Rev. Elkanah Walker was sent to the Oregon Country, which would later become the states of Washington and Oregon, for missionary work. The native people told Walker about giants that lived on and around the peaks of nearby mountains that were perpetually covered in snow. The giants were notorious among the tribe for abducting sleeping people — leaving tracks a foot-and-a-half long, and stealing salmon from nets that they would eat raw. While Walker brushed aside these stories as myth, some Bigfoot researchers say it could be further proof of Sasquatches’ longtime run-ins with man. Accounts similar to Walker’s have been told around the world for years. In 1847, reports were shared from Native Americans who spoke of “skoocooms,” a race of cannibalistic wildmen who lived on the peak of Mount St. Helens. In the 1920s a Canadian newspaper ran a series of articles that the Sts’Ailes people were offended when told Sasquatch was a legend, maintaining the tribe had close relations with the creatures, who preferred to avoid foreigners and spoke their language. According to Edwards, the term Bigfoot was first used to describe the creatures in 1958 in Northern California. A construction crew kept stumbling upon monstrous tracks in the dirt, giving a literal name to whatever was forming them. One common misconception is that there’s only one Bigfoot, and people can’t understand how it’s been alive for so long. Instead, experts believe that if Bigfoot — which can be used as a plural — do exist, multiple creatures would be scattered throughout the habitat. “Though I have never encountered Bigfoot, I have met and spoken with many who have,” Edwards said. What Edwards likes about Bigfoot more than the other creatures written about in those books he discovered as a second grader is that it doesn’t require magic to exist. There is evidence that can be found in paleontology, anthropology and zoology. Edwards likes to point out the 200-million-year period in which scientists discovered multiple species of bipedal primates living together. “People are beginning to think it’s more plausible that Bigfoot exists,” Edwards said. 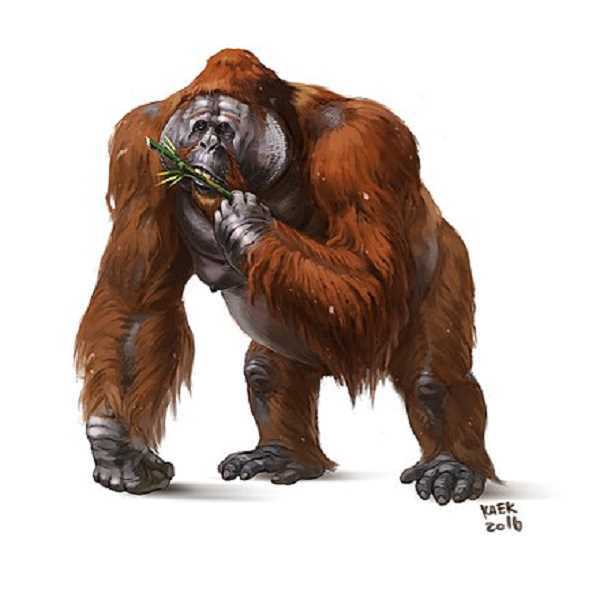 CONTRIBUTED PHOTO: KAEKART VIA CREATIVE COMMONS – A recreation of what the Gigantopithecus may have looked like, an ancient ape that Bigfoot believers think could explain how the creature made it to North America. Some proponents of Bigfoot believe it could be an offshoot of the Gigantopithecus, an extinct genus of ape that lived from perhaps nine million years to as recently as 100,000 years ago. Fossil records show the Gigantopithecus were the largest known primates that ever lived, standing almost 10 feet tall. While the giant apes lived in Asia, experts suggest they could have followed many other species of animals that migrated to the new world across the Bering land bridge near present-day Alaska — though no fossils of Gigantopithecus have been found in North America. Tracks aren’t the perfect mold of a foot, but can tell scientists a lot about what formed them. One famous example has been nicknamed “Cripple Foot,” which was cast in 1969 in Bossburg, Wash. The left foot was disfigured, leading experts to believe in it being authentic. David Howe, an orthopedic surgeon, said “it would be difficult to come up with the knowledge and the ability” to fabricate the structure of the foot pattern. The piece of evidence for Bigfoot that put the creatures in the public arena is the Patterson-Gimlin. 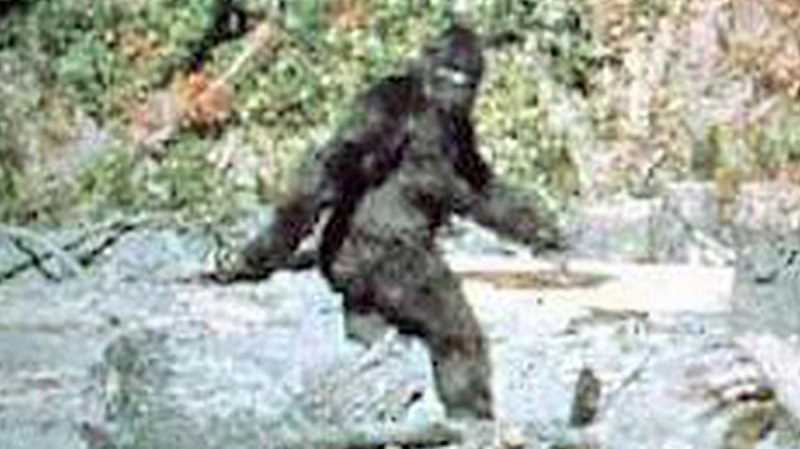 The footage shows Bigfoot on screen for less than a minute, but has spawned the classic pose with one foot forward, arms swinging. While it could be fake, as costume manufacturer Phillip Morris claimed on his deathbed, the video has never officially been debunked. 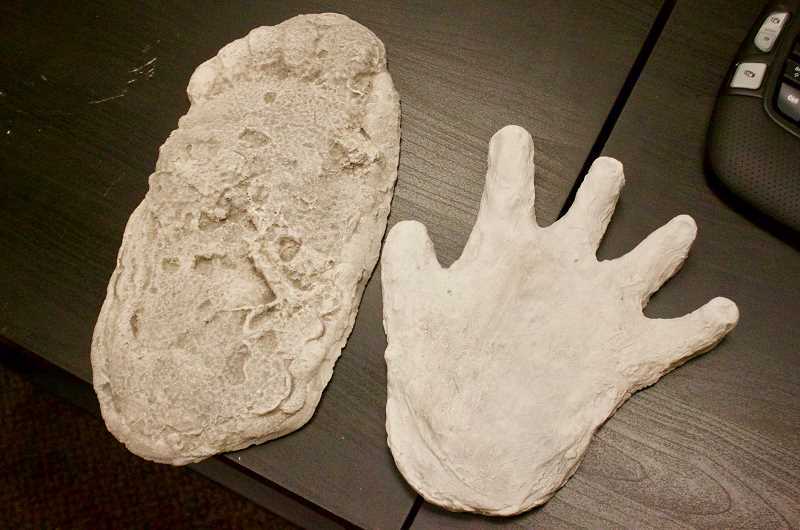 OUTLOOK PHOTO: CHRISTOPHER KEIZUR – The left footprint was found in 1967 at the site of the Patterson-Gimlin video, cast by Bob Titmus, while the handprint on the right was cast by Wes Sumerlin. The form of searching that Edwards leans toward is data analysis. Ecological niche modeling, which is used to study habitats of other animals, could show people where to look for Bigfoot. Skeptics have plenty of firepower to turn to when claiming the whole thing is a hoax. The most infamous incident was perpetuated by Rick Dyer. In 2008 Dyer announced he had a dead Bigfoot stored in a block of ice in his freezer. He and a fellow Bigfoot enthusiast Matthew Whitton claimed they discovered the creature while hiking in the north Georgia mountains. Upon closer examination, it was discovered the “corpse” was just a costume stuffed with opossum roadkill, entrails and slaughterhouse leftovers. OUTLOOK PHOTO: CHRISTOPHER KEIZUR – Greshams Guy Edwards has loved researching Bigfoot since he first learned of the creatures in the second grade. 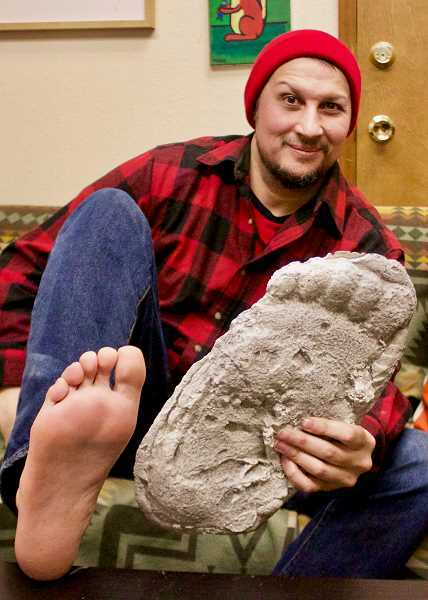 What has kept Edwards interested in Bigfoot is the strong community of fellow enthusiasts. While they all share a common interest, it is a diverse group of people who come from a variety of backgrounds and situations. Every year there is a big national conference that brings them together. Edwards is able to meet and hang out with people he is usually only able to communicate with online or over the phone. And Edwards is always happy to chat with Bigfoot novices, sharing his passion. His advice for fledging searchers — stick near bodies of water. Almost 90 percent of evidence and sightings have been within three miles of a lake or river. Oregon has been ground zero for Bigfoot sightings, with almost a third of the claims coming from the Pacific Northwest. Clackamas County has the largest number of sightings per capita. “We have Bigfoot in our backyard,” Edwards noted. He hopes new evidence will be found, proving the existence of a passion he has had since discovering that photo years ago in the school library. If this fellow raises his frequency, he might have a chance of being contacted by the intentionally elusive Sasquatch people who are NOT primitive apes.